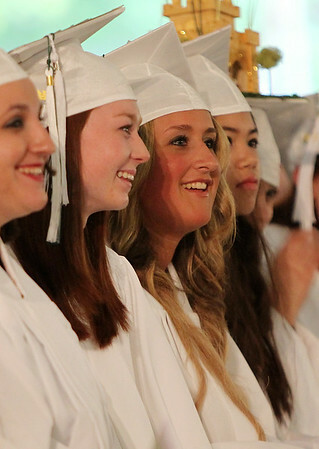 Essex Aggie graduates Ashley Boulanger, left, and Karli Brazis, right, smile while listening to the Valedictory Address given by Beverly resident Oona King, during the final Commencement ceremony for the Essex Agricultural and Technical High School. Next year Essex Aggie and North Shore Technical High School will combine into one school. DAVID LE/Staff photo. 6/5/14.